The Hatteras’s GT59 C Series blends contemporary design, outstanding open-water performance, and stellar fishability. Roaming the docks of the 2018 Fort Lauderdale International Boat Show (FLIBS), I stop to admire the beautiful lines of the new Hatteras GT59 Convertible. From my view looking aft, I note the sharp, swept stem and curved forefoot designed to smoothly splice waves at high speed, and the significant chines are sure to keep the decks and the hull dry by deflecting spray well away from the hull. Those features are key for a sportfishing machine that can power up to reach an estimated, wide-open-throttle speed of more than 40 knots. 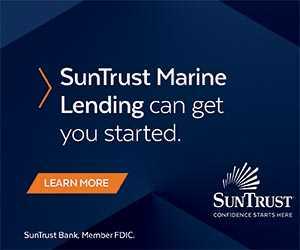 Most of all, I admire the prominent, outward-curved “Carolina” topside flare forward that adds increasingly greater buoyancy to help keep the bow up in big seas and provide additional spray deflection. That’s appropriate for an owner who wants to run to distant canyons with the knowledge that, like the four other models in the tournament-ready GT series, the GT59 is designed to get his crew out and back safely. 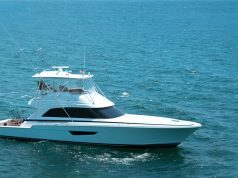 The Hatteras GT59 has three versions of twin Caterpillar C-32 ACERT diesel engines. They are rated at 1,600-hp, 1,800-hp or 1,900-hp. Like those four sister ships that currently range from 45 to 70 feet LOA, the GT59 incorporates a well-regarded, variable degree hull form that warps from sharper sections forward to flatter sections aft that adds lift to the stern underway and, in concert with the wide chines, provides optimal roll stability for better all-around performance. 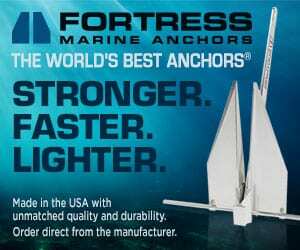 Patented hull tunnels permit flatter driveshaft angles for maximum usable engine torque and thrust that adds relief from water pressure against the transom when backing down and maneuvering ability to keep the fish in play. The large, 156-square-foot cockpit abounds with fishing and comfort features and is accented by beautiful tumblehome topside sections. Hull No. 1 on display at FLIBS and christened Hatterascal is graced with teak planking on the cockpit sole, a molded step to the starboard side deck and coamings. Beneath the teak and accessed by beautifully fit hatches, there are two insulated fish boxes with macerator, a large transom fish box that can serve as a livewell and a coaming cap for a transom door wide enough to board substantial game fish. Rod holder storage is abundant, and a bait freezer is under the mezzanine seat. No matter how you fight fish: a stout mounting plate for a rocket launcher or fighting chair is securely affixed under the cockpit sole. Mezzanine seating for three to four people stretches across the aft bulkhead, and the back cushions are separated for air conditioning outlets that take the hot and humid out of spectating or waiting for a turn at the rods. Hawse holes for mooring lines accentuate a cockpit that is clear of line-snagging deck gear. 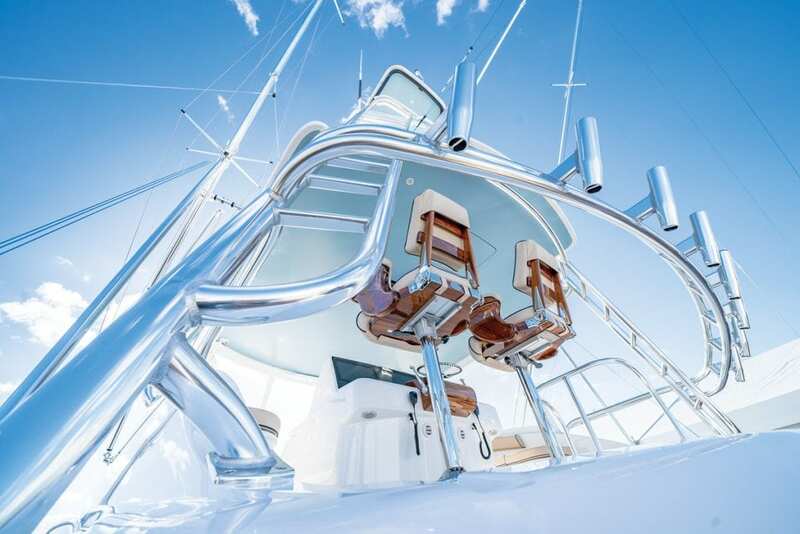 The Hatteras GT59 is fitted with a full tower from Carolina Custom Towers, a partner vendor with Hatteras, and it’s a primo piece of welding with joints ground smooth and polished to jewel-like perfection. An athwartships-facing ladder to starboard of the cabin entry door, which goes up and over the bait-and-tackle locker, is positioned properly for those transiting to and from the flying bridge; using it when the boat is rolling is far easier than ladders of those early years that faced forward. A bait freezer, two insulated storage boxes and a fridge for drinks are found under the mezzanine step. The addition of an optional Seakeeper stabilizer package might be a good choice for those who want to fish or cruise with the family. The flying bridge is command central with a captain’s helm chair on the centerline that offers 360-degree views of the water around the boat, but more importantly, its location enables clear views of the cockpit. Hatterascal sports an optional teak helm pod in a high-gloss finish for the custom steering wheel and single-lever electric controls. For seating a few more fishermen, family and guests, a second helm chair is available as are two long lounges (with rod storage underneath) that flank the helm console. 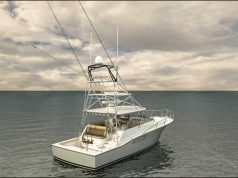 Removable, ladder-style seatbacks add two more observer positions to help keep a lookout for gamefish behind the boat. An even niftier feature is the double-wide lounge just ahead of the helm, which has plenty of room for storage or even an optional freezer. The console is nicely laid out, and more than wide enough for three large displays linked to a full suite of electronics. Hatterascal is equipped with three Garmin 8617 HD sunlight readable touchscreen MFDs completely integrated with a Garmin system package, including a 12kW open array radar, GSD-26 black box sounder, and much more. Tower electronics include a Garmin GPSMAP 7608 and backup controls for the autopilot and VHF. When the focus shifts from fishing to cruising or entertaining, the main salon of the GT59 offers all the luxury an owner could ask for. Satin-finish teak figures prominently in the salon décor with a cabin sole of contemporary vinyl flooring and interior fabrics, wall coverings and countertops selected by Hatteras Design Center professionals. Hatterascal’s high-gloss teak in lieu of the standard satin finish is stunning to the eye and to the touch. Large windows in the deckhouse sides and aft bulkhead offer wonderful views of surrounding waters and abundant natural lighting. Unexpectedly roomy is the best description of the salon layout, which features storage and a large TV screen to starboard beneath the window, a comfy sofa, and cocktail table aft to port and a wide-open, L-shaped galley anchored by a serving and food prep island with three comfortable stools to hang out with the chef. Hatteras offers three distinct accommodation deck arrangements, starting with the standard three-stateroom, two-head layout (the master stateroom head is private and ensuite) with a starboard utility room. An optional third head arrangement replaces the utility room with a large day head with shower compartment to starboard that affords more privacy for the VIP guest stateroom forward. There’s a washer/dryer combo in a locker in the companionway. For the serious fishing aficionado, the third arrangement configures the utility room as the Hatteras Integrated Tackle Storage (HITS) system designed with mission-specific safe storage of an owner’s collection of cherished rods, reels, and other gear. A 60/40 split berth arrangement option is available for the forward stateroom for dedicated fishermen with crew or lots of angler friends. Hatterascal is already booked for a busy 2019 tournament season. 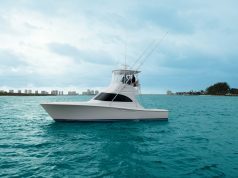 Chris and Laura Jessen, who own the successful and well-known Fish Tank Sportfishing Team, along with their captain, Ben Horning, will campaign the GT59 from Abaco, Bahamas, in May to Cape May, New Jersey, in August. If you miss them on the trail, the folks from Hatteras headquarters in New Bern, North Carolina will help you find a dealer so you can see this impressive new yacht firsthand. Displacement (full load): 92,000 lbs.